Horses Too Ugly. Literally Unplayable. This isn’t a “face” your horse is making. This is your horse’s resting face. Resting Ugly Face. At first, I thought the ESO Team was continuing the “ugly is realistic” route, not uncommon for the Elder Scrolls. While the switch from a standard horse to a draft horse made them less cute, it made sense: I’m a giant brute in heavy armor and loads of stolen goods, a tiny horse would crumble underneath me. From Morrowind – Skyrim, the people themselves also got dirtier and uglier – which again, made sense. However, Elder Scrolls Online horses are more than just ugly, and certainly not realistic – the whites of the eyes are permanently visible, rather than only appearing if the horse is extremely frightened or upset. The mouth is also permanently ajar. While the horse’s proportions are also a bit off, it’s not crazily so. Until now: Meet the Winter Garland Dapple Gray. 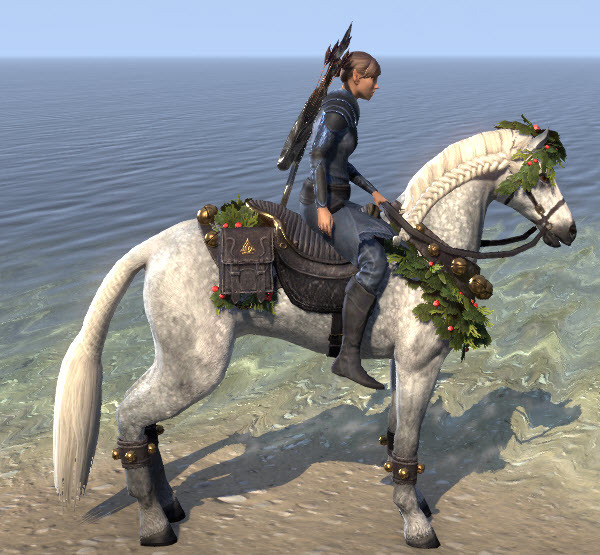 For a steep micro-transaction of $15, you too can own proof that the Elder Scrolls Online team has no idea what a horse is! The back legs are so, so wrong. The back hooves are actually behind the horse when standing, which horses only do if they’re stretching or about to take a piss. 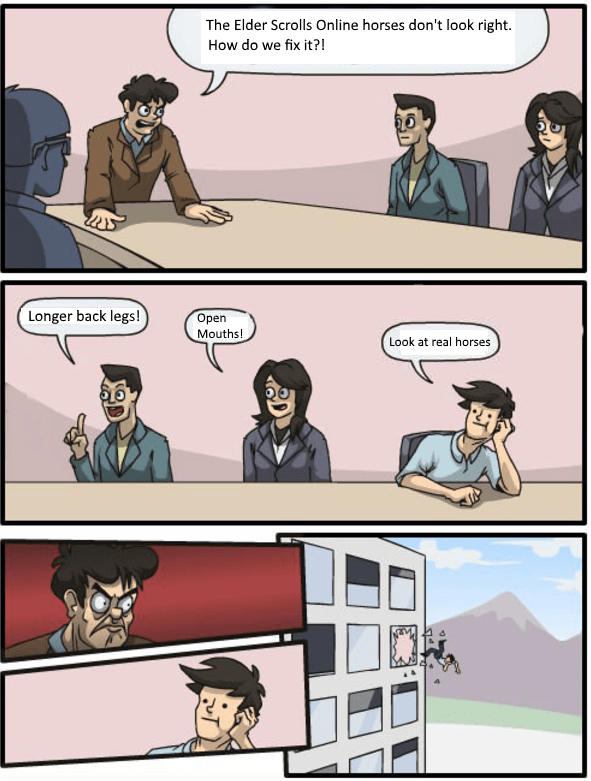 It looks like a cheap, bad, player-created mod to turn draft horses into standard horses. Wait, nevermind – the mod community did a better job than this. Some people had issues where the front knees would invert, but you can fix that by turning off Foot Inverse Kinematics. From Top to Bottom: Actual Horse, Skyrim Horse, Sims 3 Horse, Elder Scrolls Online Winter Garland Dapple Gray. Click image to enlarge. Mount on the right, rather than the left. This is exceptionally bad in a game that actually uses swords. The Elder Scrolls Online team could learn a lot from Zelda: Breath of the Wild, who had a dedicated animal designer work on the fine details of their horses. The care they put into horses really shows, and I personally think Zelda is the only game where I truly feel like I’m riding a horse (rather than controlling one). 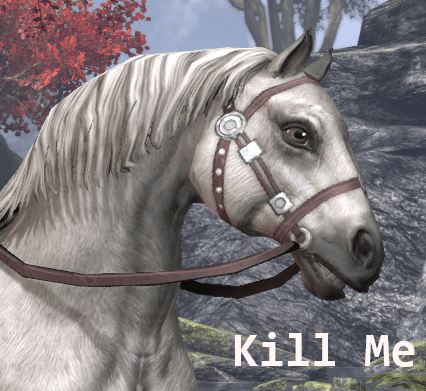 Of course, the care put into horses for the Elder Scrolls Online is also apparent: Zero. In the end it’s a video game, and the artists can draw horses however they please… but for a game that focuses on realism and intense graphics, I am ashamed.